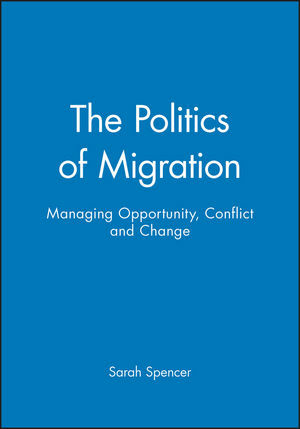 The Politics of Migration explores the opportunities and tensions posed by migration today and makes a series of strong, workable proposals for managing it effectively. An exploration of the opportunities and tensions posed by migration today. Written by some of the foremost international experts on migration and citizenship issues. Focuses on migration in Europe and North America. Covers issues such as the rise of the far right, the international politics of refugees, the impact of migration on labour markets and welfare states, citizenship, public opinion and the integration of Muslims in Europe. Makes strong, workable recommendations for managing migration more effectively. Sarah Spencer is a Senior Associate at the Institute for Public Policy Research where she writes on migration, equality and human rights issues. She has twice been seconded into the Cabinet Office / Home Office as an advisor on migration issues, is a Visiting Professor at the Human Rights Centre, University of Essex, and a founder member of the new ESRC Centre on Migration, Policy and Society at the University of Oxford. She is active on equality issues and current Chair of the Equality and Diversity Forum. 1. Introduction: Sarah Spencer (Institute of Public Policy Research). 2. Migration to Europe Since 1945: Its History and its Lessons: Randall Hansen (University of Oxford). 3. Managing Rapid and Deep Change in the Newest Age of Migration: Demetrios G. Papademetriou (Migration Policy Institute, Washington DC). 4. The Economic Impact of Labour Migration: Mark Kleinman (University of Bristol). 5. Refugees and the Global Politics of Asylum: Jeff Crisp (Head of the Evaluation and policy Analysis Unit at the Office of the UN High Commissioner for Refugees). 6. The Closing of the European Gates? The New Populist Parties of Europe: John Lloyd (Financial Times). 7. Muslims and the Politics of Difference: Tariq Modood (University of Bristol). 8. The Politics of European Union Migration Policy: Claude Moraes MEP (Member of the European Parliament). 9. The Politics of US Immigration Reform: Susan Martin (Georgetown University). 10. Migration and the Welfare State in Europe: Andrew Geddes (University of Liverpool). 11. Understanding Anti-Asylum Rhetoric: Restrictive Politics or Racist Publics? : Paul Statham (University of Leeds). 12. Immigration and the Politics of Public Opinion: Shamit Saggar (Yale University). 13. Immigration, Citizenship, Multiculturalism: Exploring the Links: Will Kymlicka (Queen’s University, Kingston, Ontario).